Gliding around the city quickly and in style are both equally important and the Quest Skateboards Super Cruiser Longboard Skateboard highlights that fact. The design of this best bamboo longboard is supplied with authentic abstract graphics, tough aluminum trucks, and PU wheels. What these exceptional features do is offer superior performance. And this helps in creating a smooth, safe, and fun experience on the city streets for all kinds of riders. The Quest Skateboards Super Cruiser Longboard Skateboard is a gear that’s considered to be the best among many youngsters. They make the most of it by using it for commuting from one place to another. The primary reason why this longboard is so popular is because it can be stored quite easily. Thanks to its compact and eco-friendly design! Since it can be stored easily, the chances of using it on a daily basis also increase. And when this happens, the gear tends to inevitably gain immense popularity in the younger segment of the population. Now that we are talking about youngsters, you should also know that the Quest Skateboards Super Cruiser Longboard Skateboard is made of multi-layered ply hardwood. Such a solid construction enables riders to carry out all kinds of tricks. Those of you who want to take it up a notch should seriously consider the Sector 9 Aperture Sidewinder Drop Through Downhill Freeride Longboard. It’s because the brand, Sector 9, has been manufacturing longboards for a while now. So you will find many riders that trust the high-quality of the gear. Constructed with renewable bamboo, the Sector 9 Aperture Sidewinder Drop Through Downhill Freeride Longboard supports all its superior quality components. The instrument is equipped with ten-inch Gullwing chargers and phenomenal 9-ball wheels. This combination goes a long way in assisting the riders in performing exceptional tricks in the safest manner. You will also fall in love with the classy appearance of the longboard. Thanks to the green wave printed graphics. The best riding experience doesn’t need to be an expensive one; it can be just as affordable as the Krown Krex 2 Bamboo Freestyle Complete Longboard. The thing about Krown Krex longboards is that they provide incredible performance even at an inexpensive cost. And just because the Krown Krex 2 Bamboo Freestyle Complete Longboard is an affordable option doesn’t mean the quality is poor. To the contrary, the gear has a beautiful design that hands out a smooth and safe riding experience. With remarkable features like bamboo-equipped board deck, seven-inch trucks and speed bearings along with a sleek design, you can get more than just a smooth and safe experience. The Krown Krex 2 Bamboo Freestyle Complete Longboard offers maximum rigidity and strength that makes the gear suitable for all types of riding styles. Before we get started, I want to bring to your notice two common issues that normally arise when people buy longboards without taking any factors into consideration. When it comes to a bamboo longboard, you must know all about its features so you can make a better decision. I have talked about these features in the next section of the article. But first, let’s find out what the two issues are so we can understand the buying process thoroughly. Bamboo longboards are more difficult to maintain than their maple counterparts. So if you still want to buy a bamboo longboard, then buy one that can be cleaned easily. Or buy one that has a bamboo and maple combination. The most common issue is that bamboo longboards don’t yield a better grip when the ground is wet. But this doesn’t mean that bamboo longboards don’t provide any grip at all. The best way to go about this is to pick the best bamboo longboard that is equipped with urethane wheels. The urethane material goes a long way in providing the much-needed grip to riders. When buying the best bamboo longboard, you should take some features into consideration. It’s important that you do if you want your longboarding experience to be better than average. So let’s get into it, shall we? You will find four different sizes when it comes to longboards; full size, midi-size, mini size, and micro size. As you all know that these four sizes belong to four different age groups. The micro size longboards are manufactured for children under 5 years of age. They have a 6 to 6.5-inch width. The mini size longboards have a width of 7 inches and are suitable for older children. But it’s the mid-size ones that are the perfect kind of longboards built for kids. While the full size versions are solely created for adults. They have a width of 7.5 inches or even higher. The wheels of a longboard determine the stability, speed, and overall performance of the instrument. They are normally composed of polyurethane material and come in different sizes and shapes. Wheels that are large in size make it possible for the rider to achieve a smooth experience even when cruising on irregular surfaces. The component that connects the board to the wheels is called a truck. The right kind of trucks ensure that your ride is smooth and steady. And these right kind of trucks should be less than ten inches in length. The best way to go about this is to check if the truck size is the same as the longboard’s width. If it is, then you’re good to go! When has the cost of something not been an important factor! We all want to buy the best equipment at the most reasonable price, don’t we? So, as far as longboards are concerned, don’t make a decision purely based on what the model looks like in the catalogue. These types of longboards may look good and fancy. But in reality, not all of them seem to work just as exceptionally. So before you shell out big bucks, think twice and pick an affordable or fairly priced option that also offers high performance. When it comes to bamboo decks, there may be many options on the market. But there are only a few good ones to choose from. And the Quest Skateboards Super Cruiser Longboard Skateboard is one of those few. The maximum durability, extremely stable quality, and surprising affordability are the elements responsible for the popularity of this best bamboo longboard. It doesn’t matter if you’re beginner or an expert, the easy maneuverability and control along with the lightweight design make the gear suitable for all types of riders. You will be glad to know that the Quest Skateboards Super Cruiser Longboard Skateboard is constructed of multi-layered ply, flexible maple hardwood and bamboo. Such materials ensure a solid and safe construction. Also, the addition of a kicktail and wheel wells in the deck adds more safety and rigidity to the riding experience. With a size as big as 44 inches, the Quest Skateboards Super Cruiser Longboard Skateboard is well equipped to withstand the weight of big riders as well. So it may be light in weight but it’s large enough and supplied with hard wheels to be apt for telecommuting. What riders love about the Quest Skateboards Super Cruiser Longboard Skateboard is its multi-layered ply deck that boasts a bamboo and maple combination. Such a blend adds maximum flexibility to the deck, making it perfect for all kinds of riding surfaces. The presence of a kicktail is like a blessing in disguise. Because this feature is perfect for beginners when they want to learn how to freeride and perform new tricks. Plus, a kicktail is also responsible for making the tasks of turning and maneuvering through a busy street easier on the rider. Don’t be discouraged by this section of the article because the flaws present in the Quest Skateboards Super Cruiser Longboard Skateboard are nearly negligible. It means that you can easily overlook them because of the kind of high performance the deck has to offer. Now, let’s talk about the tiny flaws. The longboard’s stock wheels are built to ride at maximum speed on clear roads only. This means that the wheels are not equipped to handle high speed on rocky or sticky surfaces. Another insignificant drawback is the aluminum material used for the construction of the trucks. Please don’t be mistaken; the trucks of the Quest Skateboards Super Cruiser Longboard Skateboard offer tons of responsiveness while lowering the weight of the gear at the same time. It’s only when you compare them to steel trucks that they rank lower. Because steel trucks tend to offer more responsiveness with minimum effort along with additional durability and rust resistance. But this is only a matter of preference, isn’t it? When a bamboo longboard is not only made of high quality components but also has aerodynamics, you know it’s great. The Sector 9 Aperture Sidewinder Drop Through Downhill Freeride Longboard is one such deck that is as fancy in performance as it is in price. When cruising, every rider needs more stability and speed, isn’t it? So, in order to provide these qualities, the Sector 9 Aperture Sidewinder Drop Through Downhill Freeride Longboard generates lowest friction between the board and its wheels. The trucks are also equally phenomenal. They have a double pivot design that allows the rider to move faster. So what they actually do is assist you in increasing the speed with a single momentum. The Sector 9 Aperture Sidewinder Drop Through Downhill Freeride Longboard is solely built to allow the rider to cruise in the most stable manner even at high speed. Pair this invaluable quality with the beautiful design of the longboard, and you’ve got yourself a masterpiece. When it comes to bamboo longboards, we always worry about safety, don’t we? But with the Sector 9 Aperture Sidewinder Drop Through Downhill Freeride Longboard, there is no room for such a worry. Because the gear is made of strong and stable plywood maple of the perfect width and length. And it’s this size of the longboard that keeps the feet safe even when traveling downhill. On top of that, the standing platform of the longboard is built to provide excellent stability when you have to deal with curves. If there’s any best bamboo longboard that’s reasonably priced, then it’s the Krown Krex 2 Bamboo Freestyle Complete Longboard. It boasts a maple and bamboo core construction. This combination offers maximum strength and firmness while riding across the city. The bamboo component in particular lends lots of flexibility, which allows the rider to execute any riding style. And since we’re talking about riding styles, let me bring to your notice that the Krown Krex 2 Bamboo Freestyle Complete Longboard has a freestyle design. This is great for experts who like to experiment with their longboards. You will be surprised at the amount of exceptional features the deck offers despite being the affordable pick on the list. The Krown Krex 2 Bamboo Freestyle Complete Longboard comes with strong trucks that do an excellent job at holding the wheels and board together. The best part about these trucks is that they possess high tolerance, especially for big riders. And when we talk about speed bearings, you will be glad to know that they are pretty strong and go a long way in keeping the wheels firm and straight. Many riders worry that if they invest in a comparatively cheaper bamboo longboard, the deck’s artwork will fade or peel off. But not with this one. The Krown Krex 2 Bamboo Freestyle Complete Longboard has a clean and smooth finish with high-quality artwork and spray on top of it to prevent damages like scratches. The brand, Atom has proved time and again that it can manufacture the best bamboo longboard and give it a fair price at the same time. Not many brands do that you know. How many times have you come across a product that is not as efficient as its cost points it out to be? But the Atom Drop-Through Longboard is not like that in any way. The griptape and shape of the gear provides superior comfort to the rider. While the bearing and trucks provide maximum maneuverability and stability. The straightforward design of the bamboo longboard makes it easy to use and carry around. So it’s a great pick for beginners. 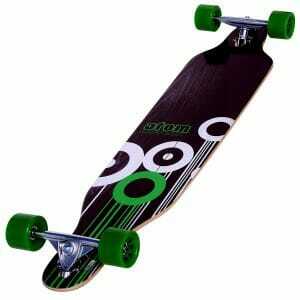 The thing that you will love about the Atom Drop-Through Longboard is that it has a sturdy and stable deck. The deck is the one and only part of the longboard that can either make or break the experience. The best decks offer a super comfortable and enjoyable riding experience. While the worst ones will make riding seem more like a struggle than pleasure. So you can celebrate the fact that this best bamboo longboard has a 100% maple laminate deck. Such a strong material can withstand a few too many bumps quite efficiently. Unlike other bamboo longboards, this one comes with hardware placed at the top instead of the bottom of the deck. What such an installation does is keep the rider lower and closer to the ground. This is useful in providing stability when traveling at high speed downhill. When I talk about the White Wave Bamboo Longboard, two words come to mind. They are simple and reliable. These two characteristics denote that the product is made of high-quality materials. Longboards are created to not only cruise around the city but also for downhill riding. And the White Wave Bamboo Longboard is no different. It is built to make the ride as smooth as possible. The gear is easy to control, especially around turns. When riding on unsteady ground, the White Wave Bamboo Longboard has the capacity to minimize shakes to provide a smooth ride. Every best bamboo longboard on the list has been tested for downhill riding. And the White Wave Bamboo Longboard is among the ones that have failed to disappoint us. The maneuverability that the deck offers during the downhill ride is truly remarkable. With this longboard, it is easier to maintain a straight line when moving downwards at high speed. You will also be quite impressed with the unique design of the White Wave Bamboo Longboard. It may seem a tad unusual at first. But not so much after you realise how the structure of the longboard helps in enhancing performance. Since the product is ranked as the best high-quality bamboo longboard, let me delve into the details thoroughly. The White Wave Bamboo Longboard has a slight concave and symmetrical shape. The former makes turning much easier as well as smoother. And the latter allows the rider to perform end number of tricks and ride in different stances. In terms of durability and flexibility, there is nothing to worry about here. It’s because the White Wave Bamboo Longboard comes with a nine ply-equipped construction. These bamboo layers are further combined with maple wood to offer additional durability. You will also be glad to know that this best bamboo longboard is supplied with griptape and boasts heat transferred artwork. These features ensure that the White Wave Bamboo Longboard doesn’t let you down in any way. The thing that you will love about the White Wave Bamboo Longboard is the fact that it is constructed with urethane material that is highly rebound. Such a feature provides exceptional shock absorption capacity. Many riders appreciate the size and shape of the longboard’s wheel base. It measures 32 inches and helps in generating additional stability when riding. The last component that I want to talk about is the rebound bushing. The bushings and aluminum trucks of the White Wave Bamboo Longboard go hand in hand. And what they do is make up a flexible core that boosts the performance level when riding over pebbles and cracks. The Sector 9 Blue Wave Lookout Drop Through Longboard Skateboard is primarily designed for those who love to carve and cruise or go downhill at a great speed. Throwing out slides or performing a check on speed can be done with the Sector 9 Blue Wave Lookout Drop Through Longboard Skateboard quite efficiently. The bearings fixed on the premium wheels of the longboard are strong enough to cruise over various surfaces in a very smooth manner. The design of the longboard is narrower in the region where its wheels are attached. This is done to avoid cutouts. You will find some premise behind the design of the board. This is a very common feature that prevents the wheels from rubbing during fast turns. The drop-through feature of the longboard’s platform is one that offers riders a free-riding experience along with cruising. With the Sector 9 Blue Wave Lookout Drop Through Longboard Skateboard, riders can feel free to slide with ease or find stability in a variety of different conditions. The best and most unusual feature of this bamboo longboard is the griptape. Most boards on the market are built with only one section that has the grip. But the Sector 9 Blue Wave Lookout Drop Through Longboard Skateboard is covered with griptape completely. This helps in positioning the feet correctly and also boosting safety and confidence when the speed is pretty high. If you’re looking for the best bamboo longboard with a classic pintail shaped design, then you’re in the right place. The Atom Pintail Longboard is elongated equally in the front and the rear region. This is how longboards were created when they first came into existence. This classic design of the bamboo longboard is even more enhanced with the kind of aerodynamics and stability that the gear provides. And with a shape and construction like this, riders don’t need to worry about the formation of wheel bite. This is great for beginners as it enables them to focus on their riding without any sort of distractions. So if you want to cruise in the most stable manner while also avoiding traffic and overcoming obstacles like pavement cracks, then this might be an ideal choice for you. The Atom Pintail Longboard comes with a large deck that’s maple laminated to add maximum stability and superior comfort. Because your riding experience needs to be enjoyable and carefree, doesn’t it? The three important features of any bamboo longboard are the wheels, bearing, and trucks. The aluminum trucks of the Atom Pintail Longboard are lightweight yet strong enough to provide maximum endurance. The bearings with its strong and practical design make the instrument perfect for beginners. And the urethane wheels offer an excellent grip on the pavement. So you don’t need to worry about losing control or stability when traveling at high speed. The wheels of the Sector 9 Green Wave Lookout II Downhill Longboard Skateboard is what make it suitable for downhill riding. Unlike other longboards on the market, this one is equipped with 74-mm instead of 70-mm wheels. This way the rider can achieve the faster speed required for downhill riding. In terms of durability, you have the camber mold and laminated, renewable bamboo construction to take care of that. The best part about the Sector 9 Green Wave Lookout II Downhill Longboard Skateboard is that its trucks have an excellent drop through arrangement. What this does is lower the gravitational center to provide maximum stability. Such a feature also makes the longboard easy to control, especially when you’re sliding. What you should know about the Sector 9 Green Wave Lookout II Downhill Longboard Skateboard is that it’s equipped with Gullwing trucks. These are comparatively wider than most trucks found on bamboo longboards. And this is useful for ensuring that your ride is as stable as stable can be. So if you’re a rider who loves speedboarding, then the Sector 9 Green Wave Lookout II Downhill Longboard Skateboard might be an ideal choice for you. Thanks to its 74-mm wheels that generate higher speed in the safest manner. If you want to own a longboard with a maple and bamboo core construction in a kicktail shape, then there’s nothing better than the Krown Krex 2 Bamboo Kicktail Complete Longboard. Such a design provides riders with a longboard that boasts high levels of rigidity and strength. The gear is well equipped with double-layered baked bamboo wrapped around the maple core. This creates a strong and rigid deck along with a flexible point that appears to be beautiful. On top of that, quite literally, there is a spray coating that enhances the look of the bamboo and makes the cleaning process easier. The kicktail design of the Krown Krex 2 Bamboo Kicktail Complete Longboard is supplied with 71-mm wheels, speed bearings, and trucks. All these combine to provide all kinds of riders with a fluid riding experience. The thing about the kicktail shape is that they allow the rider to turn easily. And this is achieved without even scraping off the tail. So it’s safe to say that bamboo longboards with a kicktail design are the easiest decks to ride. The Rimable Bamboo Drop Through Longboard is solely created to meet all the requirements of the rider. And what’s that one requirement that ranks the highest on every list? It’s the factor of durability. Each and every feature that I talk about here offers long-lasting quality to the whole riding experience. The PU wheels of the longboard can handle rough terrain, thus making the ride as smooth as possible. They are built to generate maximum stability along with speed. These wheels have the capacity to grip well without wobbling even at considerably high speed. In terms of the design, the Rimable Bamboo Drop Through Longboard has a laminated maple-equipped deck. What this does is enable the rider to turn safely even when he or she is riding fast. The nine-layered ply material used for the deck is so firm and strong that it can support heavy weighted riders as well. Now let me tell you a little about two other invaluable features of the Rimable Bamboo Drop Through Longboard. The first is the seven-inch aluminum truck. This particular element provides good balance and keeps the wheel running smoothly. Something like this can go a long way in increasing speed at maximum acceleration. The second feature is the high speed lubricant on the bearings of the wheels. The lubricant enhances the level of performance to a great extent, thus providing the wheels with tons of stability when the speed is high. No matter what your riding style or technique is, it’s always a better idea to invest in the best bamboo longboard that is suitable for all types of riders. And the process of finding one may be a tad troublesome, but it’s crucial if you want the experience to be both enjoyable and safe. Expert skaters and beginners will benefit the most if they select the best bamboo longboard on the market. So what truly matters is the rider’s size, the quality and construction of the deck, wheels, and trucks. Now this doesn’t mean that the other features are not important. Of course, they are but not as much as the essentials. And it’s because of this reason that the Quest Skateboards Super Cruiser Longboard Skateboard has been selected as our best pick. This particular bamboo longboard helps in understanding that longboarding may be an extreme sport but it can also be enjoyed in every possible way. With a longboard like this, riding can become a wonderful experience and you can expect so much more from the adventurous sport.